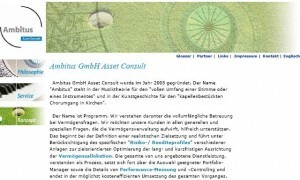 Ambitus GmbH supports your efforts when it comes to structuring Pension solutions. Especially important when you are based outside continental Europe and need help from an expert who knows the pros and cons of all the relevant vehicles including the CTA’s that have become quite “fashionable”. You will enjoy working with expert people who have gained their marks not only in the financial world but also in industry. And that both in Germany as well as neighbouring countries. Our highly recommendable Agency for photography, Corporate- and Internetdesign is Roskothen Neue Medien & Design based in Grefrath near Krefeld / Düsseldorf in North Rhine Westphalia.